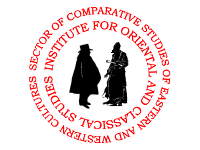 The Sector of Comparative Studies of Eastern and Western Cultures is an interdisciplinary and interdepartmental unit. Some of its core faculty are employed in whole or in part by the IOCS, but also associated with the Sector are people teaching and researching at other universities and academic institutions in Moscow and abroad, making it a wide-ranging group of specialists in oriental, comparative and translation studies. Culture as a way to coin meanings; the translatability of cultures. The results of the research carried out by the Sector are immediately applied in the teaching activity of the Sector. The Sector hosts regular meetings of a theoretical seminar, which offer the opportunity to discuss these issues applied to specific material. The suggested solutions are reflected in the publications. © 1996 — 2018 Russian State University for the Humanities.